Pakistani journalist Rina Saeed Khan travelled to Abbottabad for Swedish national newspaper Svenksa Dagbladet. The newspaper wanted a local journalist who could write an article from the scene, speaking to neighbours about what had happened and whether they had suspected anything. They also commissioned an analysis piece looking at the implications of the American army operation on Pakistan’s military and foreign relations. The news article was also run in Gazeta.pl, the online version of Poland’s main newspaper. As a result of this coverage, Rina was contacted by Swedish TV show Agenda, a national current affairs television programme. She was interviewed on camera from Pakistan, answering questions such as what impact the events were likely to have on Pakistan’s relationship with America. Rina is a freelance journalist based in Lahore. She first wrote for Panos as a fellow on the Climate Change Media Partnership (CCMP) programme. Through the LSJ project she has now started writing for the Guardian’s Global Development website, contributing to their Poverty Matters blog section. Our journalists Aunohita Mojumdar and Wambi Michael wrote articles on what it’s like to works as a journalist in a developing country for World Press Freedom Day on May 3. Their articles were printed in Sydsvenskan, a large regional newspaper in Sweden. 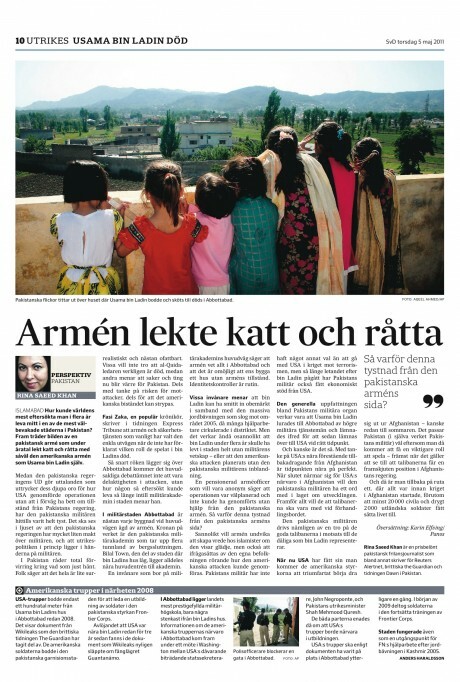 Aunohita also had an analysis story on the reacton in Afghanistan to Osama bin Laden’s death published in Sydsvenskan. Aunohita is an Indian freelance journalist currently based in Kabul who has reported from the South Asian region for 19 years. Wambi is an independent radio and print journalist based in Jinja, eastern Uganda. His work for Panos includes articles on Uganda’s mooted anti-homosexuality bill and a feature about two men who convert rubbish into petrol. And finally, Panos journalist Machrine Birungi, from Kampala, Uganda, had a story published in El Mundo, Spain’s largest online newspaper. El Mundo plans to publish one Panos feature every week. 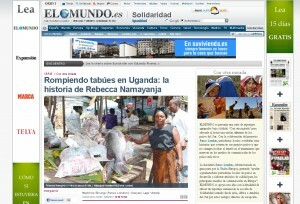 Machrine’s article, about Rebecca Namayanja, a fisherwoman who has set up her own fishing business, is the first one in the series. Machrine is a deputy editor at the Uganda Radio Network. Panos London’s LSJ project aims to get journalists from developing countries writing for European newspapers. We are really pleased that these media outlets are working in partnership with Panos London and we will be tweeting and posting on Facebook and on our website as these journalists are commissioned and published in the future.